"In judging the effectiveness of leadership and management, inspectors must also judge whether the school’s arrangements for safeguarding pupils are effective, and whether those responsible for governance ensure that these arrangements are effective." - Ofsted School Inspection Handbook. The role which the school governor plays in not only developing, but also implementing an e-safety strategy is vital. The Department for Education have highlighted a number of key features of effective practice in relation to online safety in schools and Ofsted have placed greater emphasis on inspecting the effectiveness of the governing body in ensuring that schools meet all of these criteria. Governors also need to challenge and support their SLT if they are falling short. To help your school governors learn more about their e-safety responsibilities, they can complete this bespoke online training course, written by e-safety consultant, Tim Pinto who has a vast experience of working in education and digital safeguarding. He is also a member of the CEOP Education Advisory Board. Register before 31st March 2017 to receive the governor training FREE. Issues facing schools around online safety. All school governors are welcome to register for the training before 31st March to receive it free. A link to the training will be send via email on 31st March 2017. 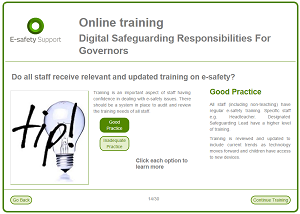 After 31st March, the training will only be available to E-safety Support Premium Plus members. If you are already an E-safety Support Premium Plus member, you can distribute the training to your governors via your E-safety Support Dashboard. Is this training online, or at a physical location please? Many thanks. Hi Jo, thank you for your enquiry. Our governor training is exclusively available to Premium Plus members, who also have access to all the staff and parent training courses too, along with the teaching resources, staff guidance and parent support materials we offer. They also have access to policy document and audit tools. In order to make our Premium Plus membership cost effective, all the training is available with unlimited use within your school community. For primary schools, the costs for annual membership is just £299 (plus VAT) for full access. For secondary schools, the cost is £499 (plus VAT).